A Kickstop Door Reinforcer is used to reinforce and strengthen a wooden door around a traditional UK lever, euro profile or oval profile cylinder mortice lock. Fitting a mortice deadlock, or sashlock involves removing wood and this leaves a very weakened area around the mortice lock. 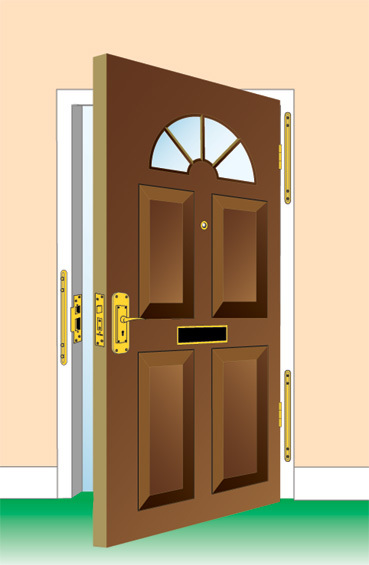 The LockGuard plates are bolted together through the door - to resist a 'kick-in' attack and so help avoid a burglary. The 2001 HingeGuard product has no keyway and is designed to strengthen the door adjacent to the hinges, any other weakened part of the door or as a bolt through 'blanking off' plate. Kickstop has Door Reinforcers in many colours and finishes for UK, Euro Profile and Oval Profile cylinder mortice deadlocks and sashlocks. Product code 9600: - 188 x 35 x 7mm - bevelled edge to resist side impact - all keyways. Product code 2000: - 203 x 50 x 3mm - flat plates - all keyways. Product code 9601: - 300 x 29 x 7mm - bevelled edge to resist side impact - all keyways. Product code 9601: - 300 x 35 x 7mm - bevelled edge to resist side impact - all keyways. Product code 9619: - 240 x 75 x 3mm - reversible flat offset plates - universal keyway. Product code 9625: - 240 x 100/75 x 3mm - reversible flat OFFSET plates (wider internal plate) - universal keyway. Product code 2001: - 203 x 50 x 3mm - flat plates - no keyway.